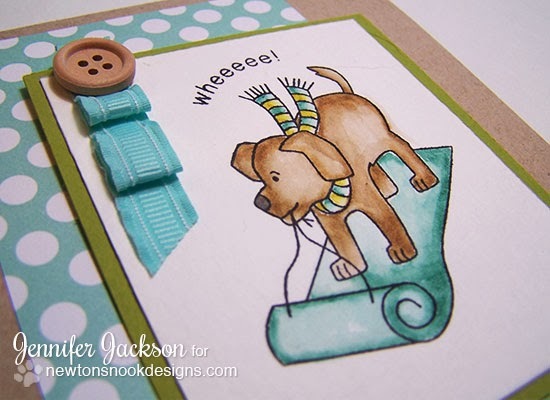 Here's a fun card I made using the sledding puppy from our Snow Day Stamp set! I stamped him onto watercolor paper and had fun coloring him in teals and greens using distress markers. Doesn't he look like he's have fun sledding? 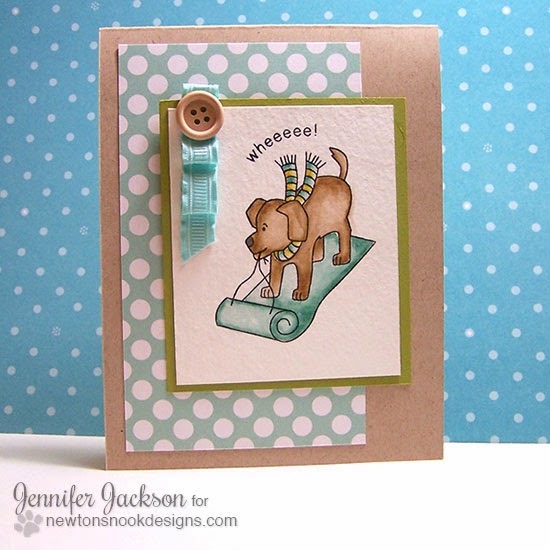 I added him onto this card with some ribbon that I glued down in at "ruffle" and added button to the top. I think this turned out to be a really fun color combo! Another thing I like about this card is that it could be for any occasion! It's just a cute, fun card you could send out to anyone! Adorable!!! I just love the little dog and the colors you used are just perfect. I used this stamp for a Christmas card for my neighbors. I cut some hills of snow and had him sledding down. On one of the other hills was a little dog (the neighbors dog) watching Bear sled. Love your card. super cute! love the polka dots with that puppy!